We've been offering the Niagara Conservation Stealth toilet on our Green Products web store, Conservastore.com for over a year. The Stealth is perhaps the lowest water requiring Tank Style toilet made in the world. 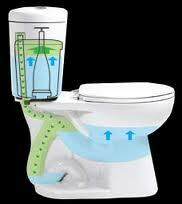 It uses a paltry 0.8 gallons per flush instead of the 1.6 or 3.5 gallons per flush that most toilets sold in the USA use. The Stealth has been a great product for us and we want you to know why. Here are excerpts from a nice review on Green-Buildings.com on how the Stealth is different from other toilets on the market. "The (Stealth) name comes from the quiet flush, which is pretty remarkable considering the amount of waste it can clear (500 g, which is a lot). The Stealth toilet (still awesome name) utilizes the energy created by the domestic water used to fill the tank to pressurize the bowl’s trap. When the user pushes the flush button, the waste in the bowl is evacuated through a patented vacuum effect that takes place when the exiting water in the chamber depressurizes the trap, creating suction (check out http://stealthtoilets.com/pages/howitworks.html for more info and http://vimeo.com/2161347 for a comparison video). From what I’ve seen on the market, I would estimate its closest competitor is the Kohler Pressure-Lite 1.0 gpf product line (equipped with a Sloan Flushmate). The Sloan Flushmate is a pressure-assist toilet operating system that also utilizes the energy of incoming water pressure. The difference comes in that the pressure is used to compress air, which is what forces the water back into the bowl, ‘pushing’ the waste out with what Sloan describes as ‘vigorous flushing action’. The disadvantage of this product, if you want to call it that, is that while the Pressure-Lite looks like a ‘regular’ toilet, one flush (and the noise associated with it) could startle a first-time user. In a small office building, that might not be an issue. But in an apartment building, I could see being able to hear your neighbor’s flushing with the Pressure-Lite (with thin walls) possibly. Check out a video of the pressure-lite flushing here: http://www.youtube.com/watch?v=JrdkU-_ecCk&feature=related. But don’t get me wrong, I think the Sloan Flushmate is a great product as well. It comes in 1.6 or 1.0 gpf options (and it’s currently offered in 10+ manufacturer’s products), you can read more about it here: http://www.flushmate.com/HowItWorks/. It’s also worth mentioning that Niagara produces a 1.0 gpf pressure-assist toilet too, with technology similar to the Flushmate. But ultimately I’d say the sound (and the additional water savings of 0.2 gpf) is where the Stealth has the advantage. So since the Stealth saves about 20% more than the 1.0 gpf, that can add up to about 20,000 gallons of water (and $100 savings) per year, based on FEMP numbers and a national average water and wastewater combined rate. Given that the Stealth currently retails for $300, that’s a payback of about 3 years."